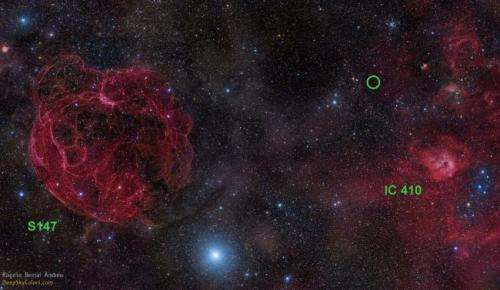 The finding by an international team of astronomers, published July 10 in The Astrophysical Journal, marks the first time that a so-called "fast radio burst" has been detected using an instrument other than the Parkes radio telescope in Australia. Scientists using the Parkes Observatory have recorded a handful of such events, but the lack of any similar findings by other facilities had led to speculation that the Australian instrument might have been picking up signals originating from sources on or near Earth. "Our result is important because it eliminates any doubt that these radio bursts are truly of cosmic origin," said Victoria Kaspi, an astrophysics professor at McGill University in Montreal and Principal Investigator for the pulsar-survey project that detected this fast radio burst. "The radio waves show every sign of having come from far outside our galaxy – a really exciting prospect." Exactly what may be causing such radio bursts represents a major new enigma for astrophysicists. Possibilities include a range of exotic astrophysical objects, such as evaporating black holes, mergers of neutron stars, or flares from magnetars—a type of neutron star with extremely powerful magnetic fields. "Another possibility is that they are bursts much brighter than the giant pulses seen from some pulsars," notes James Cordes, a professor of astronomy at Cornell University and co-author of the new study. The unusual pulse was detected on Nov. 2, 2012, at the Arecibo Observatory, a National Science Foundation-sponsored facility that boasts the world's largest and most sensitive radio telescope, with a radio-mirror dish spanning 305 metres and covering about 20 acres. "The brightness and duration of this event, and the inferred rate at which these bursts occur, are all consistent with the properties of the bursts previously detected by the Parkes telescope in Australia," said Laura Spitler, lead author of the new paper. Dr. Spitler, now a postdoctoral researcher at the Max Planck Institute for Radio Astronomy in Bonn, Germany, was a PhD student at Cornell when the research work began. The discovery was made as part of the Pulsar Arecibo L-Band Feed Array (PALFA) survey, which aims to find a large sample of pulsars and to discover rare objects useful for probing fundamental aspects of neutron star physics and testing theories of gravitational physics. Efforts are now under way to detect radio bursts using radio telescopes that can observe broad swaths of the sky to help identify them. Telescopes under construction in Australia and South Africa as well as the CHIME telescope in Canada have the potential to detect fast radio bursts; astronomers say these and other new facilities could pave the way for many more discoveries and a better understanding of this mysterious cosmic phenomenon. 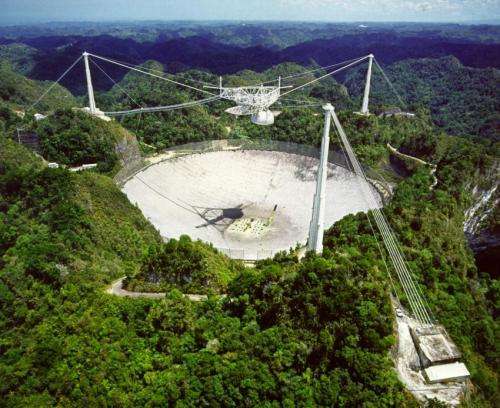 More information: "Fast Radio Burst Discovered in the Arecibo Pulsar ALFA Survey," by L.G. Spitler, J.M. Cordes, et al. The Astrophysical Journal. Published online July 10, 2014.
galaxys centre supermassive concentrations expanding and "emit" expanding densers which together mide have a nature of expanding protons and expanding neutrons which "emit" expanding densers which mide together have sometimes nature of expanding electrons or expanding photons! Expanding space is god which is not exist! You realize your post is completely unintelligible don't you? Guess not. How do you expect people to take you seriously if you write gibberish? Perhaps you think gibberish as well. This is not uncommon. I don't.. think you are supposed to take that troll seriously at all. I mean come on, expanding and emit expanding densers. To top it off that website is a load of crap that is also completely unintelligible. IF you want to spread misinformation and confusion you have to at least present it more coherently like most of the other 1*Trolls on here. At least I can read their comments and laugh, but this Mr. pressure... its just sad. We need to find something new that's expanding and call it a denser. Irony demands it. I'm depressed. You've already taken the stroke approach, and the "genuine frontier gibberish" schtick seems pointless after Ghost's post...what's a smart alec to do? What was the particular frequency of the radio waves? It's not gibberish, it's spam. Notice the URL at the end? yell "Rebernt" like Gabby does after everything in the meeting! i dont know... if you can translate the page, you will find it pretty much is gibberish... like his rant above.